Mario Draghi, president of the European Central Bank, told a press conference following the meeting of the ECB Governing Council in Frankfurt this afternoon that “the euro is irreversible”. Asked by the media what he meant by that he exclaimed to much laughter “It stays, it stays, it stays. 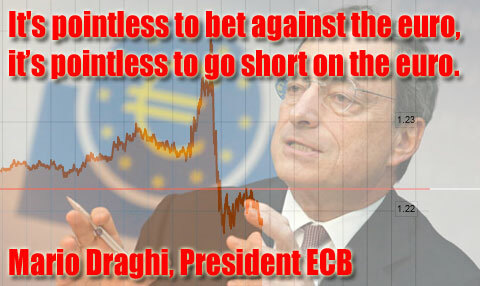 It’s pointless to bet against the euro, it’s pointless to go short on the euro.” From the beginning of the press conference to the end the € fell 200 pips against the $, so he was proved factually incorrect before he even finished speaking.